Welding is the most dangerous job in the construction industry. There are more than half a million welders in the United States. Among them, the lifetime risk of fatal injury is more than four per thousand workers. Employee safety is not the only reason why you need to ensure your employees go on a welding safety course. Once your product leaves the shop floor, a faulty weld can bring down an aircraft, cause an explosion, and harm innocent people. Welder’s Flash – Arc welding produces intense ultraviolet rays. Not only can the intense heat cause sunburn to the skin but, without proper protection, workers can develop a painful eye condition known as Welder’s Flash, which develops over a few hours. At worst, it can lead to permanent retinal damage, loss of vision, cataracts, and increased sensitivity to light. 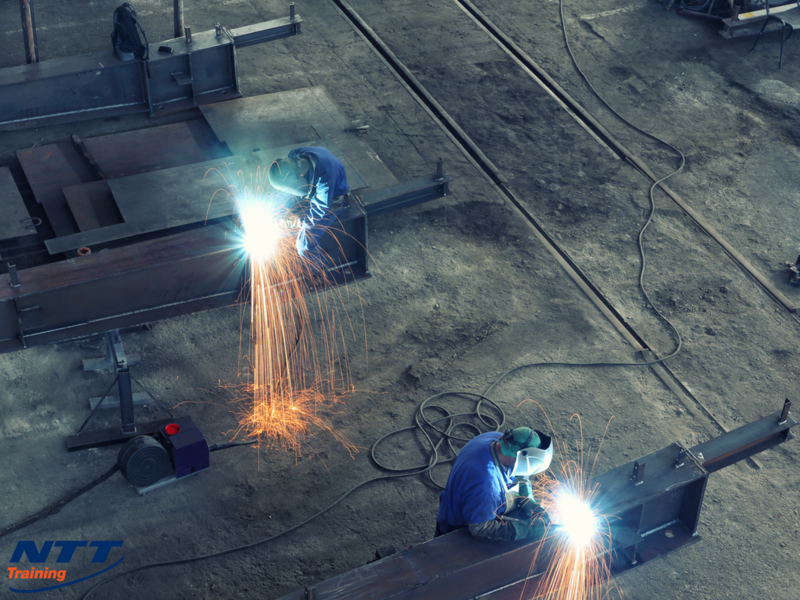 Sparks and metal fragments can also damage a welder’s vision. Auto-darkening helmets can protect the welder’s vision and improve the quality of his work because he can better see what he is doing. Manganese, a metal found in wire, electrodes, and welding rods, can cause nerve damage and destroy brain cells. Toxic manganese vapor can be inhaled and transported to the brain. Manganese toxicity, also known as manganism or welder’s Parkinson’s Disease, anxiety, dementia, ataxia (the loss of control of body movements), and a mask-like face; these symptoms resemble Parkinson’s Disease. The damage from manganism is irreversible. According to OSHA, the Permissible Exposure Limit (PEL) for manganese is 5 mg/m3. Exposure can be controlled by using the correct personal protective equipment and by recommended work practice controls. Damage to hearing – Excessive noise, typically above 85 decibels, and hot, flying debris that pierces the ear canal, can cause permanent hearing loss. In April 2016, OSHA issued fines against two companies in Minnesota that had contributed to the death of a welder when the storage tank on which he was working exploded. Neither the manufacturer of the tank nor the factory where it was installed had measured the flammability of the soap stock inside the tank. In December the same year, another welder who was working in a tank at an ethanol plant in South Dakota was killed by a fire inside the tank. By now you will have gained an appreciation for the importance of safe welding practices, both on your shop floor and for years after your product rolls off the assembly line. In order to make sure you send the safest, most carefully manufactured product out the door, invest a little time and resource into sending your welders on a seminar on welding principles and procedures. They will also learn how to safely apply the practices of metallurgy, welding safety and inspection, and troubleshooting into the welding process. This is a valuable course for: mechanics, welding technicians, maintenance techs, building engineers, managers & superintendents, plant & facility maintenance technicians, and owners & managers. Yes, you, too, should give some careful thought to taking a seminar. Participants will also learn about the metal cutting process and understanding weld prints. Additional agenda topics for this training include: principles & procedures of welding repair, welding and cutting safety electric arc welding equipment, and welding certification requirements. If you believe your workers and company in general would benefit from a welding safety seminar, contact us at NTT Training and see what your options are for customized welding safety training sessions.